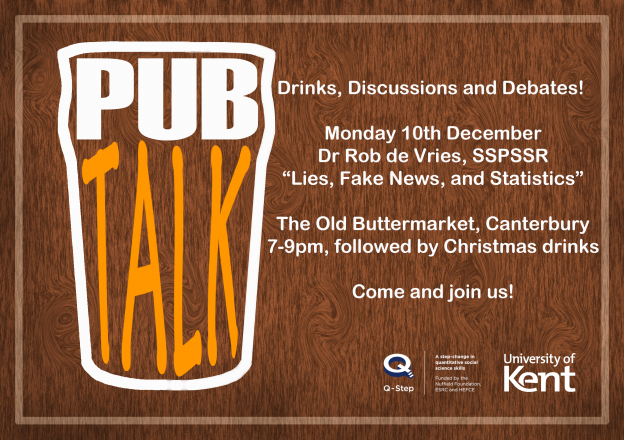 SSPSSR’s very own Dr Rob de Vries is giving a Q-Step ‘pubTALK’ on Monday 10 December at The Old Buttermarket, Canterbury, at 7pm for a 7.30pm start, followed by Christmas drinks. Everyone is welcome! Rob has recently published a new book, Critical Statistics: Seeing Beyond the Headlines and his talk, based on his findings, is called, ‘Lies, Fake News and Statistics’. Browse your social media feed, turn on the TV, or open your news website of choice – chances are it won’t be long before you come across a story based on a statistic. Maybe it’s that ‘70% of married women have cheated on their partners’ (The Washington Post) or that ‘32,000 people in the US die from gun violence every year’ (tweet by US Senator Tammy Baldwin) or that ‘One in five British Muslims sympathise with Jihadis’ (The Sun). The news is full of numbers for a good reason: numbers and statistics are vital to understanding what’s really going on in the world. But they can also be deceptive. In the wrong hands, they can easily end up giving us a distorted picture of reality. In this talk, Robert de Vries will show how understanding a few simple tricks and some basic statistical concepts can help us see the truth behind the numbers in the news. This entry was posted in Campus online, Medway Student, Student Guide on 2 December 2018 by Allie Burnett.